Yoga Bag | Who Are You Calling Crafty? I have been going to Pilates for a couple months now on Tuesday and Fridays. I have gotten over my fear of exercising with others. Surprisingly I am enjoying it and actually feel guilty if I don’t make it (guilt is a wonderful motivator some days). One of the ladies showed up last week with an amazing yoga bag, I had been searching for one but refuse to pay $10 for a cheaply made yoga bag. She said she made it and got the pattern online for free, the website was Amy Butler Designs. I found the pattern (called Nigella Yoga Bag), printed it out and doubled checked to see if I had everything I needed to make the yoga bag. Much to my surprise I did so I got to work. The pattern does involve a lot of ironing (especially if you use interfacing (like I did) but the end result is fantastic. I do own an ironing board and I do know how to iron but I only ever use it for sewing projects. I even pulled out more than two pins to create this project. 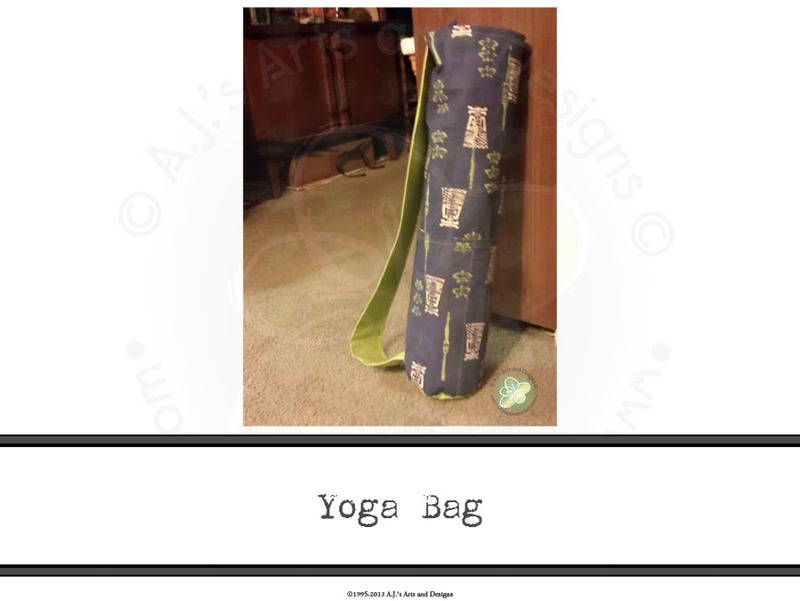 My finished yoga bag. It holds my wallet, my keys, water bottle and mat. Not too shabby if I do say so myself.